The Second Army was inactivated on Friday after three years in a status that Army officials call unprecedented. In a unique arrangement, Second Army was activated in 2014 as the parent organization for the Army's Network Enterprise Technology Command. With no soldiers assigned to it, Second Army had the job of improving command and control between NETCOM and Army Cyber Command, according to a Monday release from the Army. Second Army has been closely associated with Army Cyber Command, with the two sharing one commanding general. When the arrangement was set up, the ARCYBER commander had his staff also run Second Army, officials said. ARCYBER was formed in 2010, and as it has taken its place as one of the Army's service component commands, the organization has evolved. Now NETCOM reports directly to ARCYBER. NETCOM is responsible for operating the Army's segment of the Department of Defense Information Network and has assets at Fort Huachuca, Arizona. "Today is not an end, but the recognition of another chapter in Second Army's distinguished history," Lt. Gen. Paul Nakasone, commander of ARCYBER, said during a ceremony Friday at Fort Belvoir, Virginia. "The legacy and spirit of Second Army will live on in the men and women of Army Cyber Command." Nakasone and ARCYBER Command Sgt. 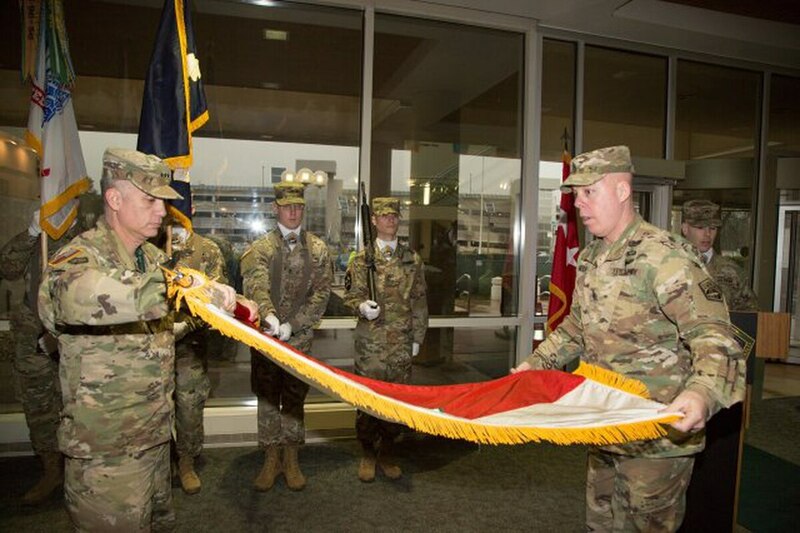 Maj. William Bruns cased the Second Army colors at the ceremony. Second Army was officially discontinued on Jan. 18 to "improve Army readiness and achieve unity of command," according to the Army Cyber Command website. NETCOM was reassigned to ARCYBER, which received Second Army's lineage and honors. "We were not in accordance with the regular process," said the ARCYBER command historian, Dr. Lawrence M. Kaplan, in the release. "There was no precedent for this in Army history." Inactivating Second Army now will "improve the ability of Army Cyber Command to operate and defend all Army networks," he said. This is the fourth time Second Army has cased its colors since it was activated as a World War I fighting army almost 99 years ago, according to the release. Gen. John "Black Jack" Pershing, commander of American Expeditionary Forces, ordered the newly formed Second U.S. Army to push toward Metz, France, in an effort to drive the Germans out of the country in November 1918. Second Army launched attacks on the Germans on Nov. 10 and took back about 25 square miles of French soil before fighting ended with the armistice on Nov. 11. In World War II, Second Army was a training organization, preparing 11 corps and 55 divisions for deployment to all theaters of operation, according to its history. ARCYBER is training soldiers, hiring civilians and building a new headquarters at Fort Gordon, Georgia, that represents a turning point for the nation’s fight in the cyber domain and on the multi-domain battlefield. The new headquarters, which had its ground breaking in November, represents "an investment in the Army’s future readiness that will ensure cyber teams, in both offense and defense, can train, plan and operate in a state-of-the-art facility," Nakasone said. The center will be total Army, with active Guard and Reserve soldiers taking part in operations. It will also bring together cyber experts from industry, intelligence assets and academia to work with the military there. It is expected to be occupied for operations within the next three years.